Ok, so I knew eventually I would have to make these. My relationship with onions is a freaky one for sure. I hate onions. I love French Onion Soup. I enjoy onions in things if they are unrecognizable. I don't know, it is all to much to think about, so I just go with the flow. Sometimes I am a yes and sometimes I am a HECK no! I decided with football season and lots of burgers and fries nights, game parties and gatherings, that onion rings would be a nice addition to the menu. You can dip them in anything and they involve beer. I mean, really, how much more important is THAT in a game day party? I had brought home some delicious sweet vidalia onions from our trip to Georgia and I wanted to get them used up. I only did 1 medium onion with this recipe, but sadly, and regretfully I only used half of the batter. So I will say this will do at least 2 medium onions, if not more. 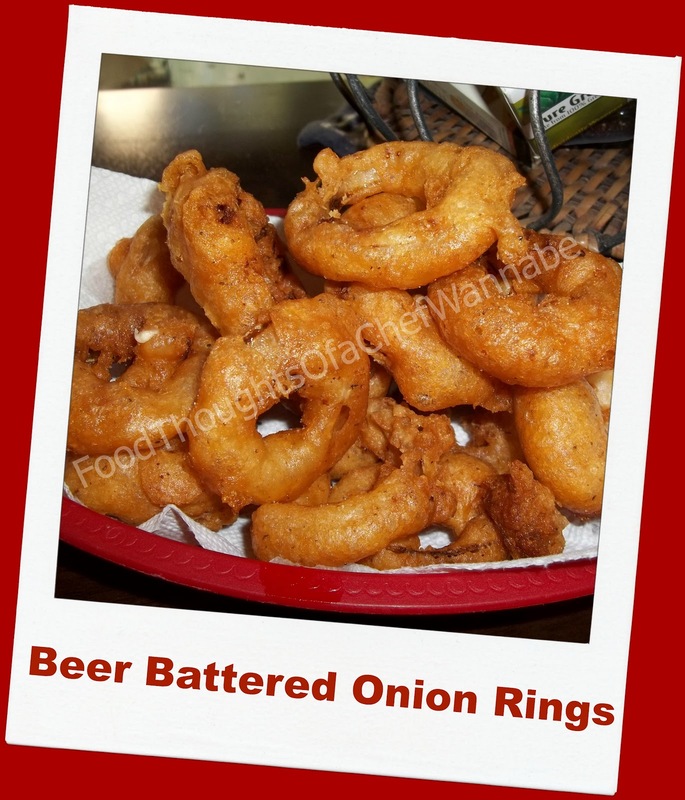 Here is a tip, if you are nearing the end and still have onions to dip, add a little extra beer, it will be a bit thinner but it will be equally as delicious and you won't have any naked onion rings! Heck you might like your batter a bit thinner than mine anyway, so regardless, just do what makes your insides tingle! Now get slicing those onions, however you like, thick or thin. Which do you prefer? I soaked my onions after I sliced them, in a beer. This tenderizes them a bit while still keeping their shape. You can do this with buttermilk if you choose as well. Just make sure to soak at least 30 minutes and up to 2 hours. Do not soak them any longer or you will have limp, weasley looking onions nobody will recognize as rings. FAIL. It is so easy, make sure to fry in deep enough oil, maybe 3-4 inches of oil is what I used. Get it to 350 degrees. Get your oil heating up. Drain ALL of the liquid that your onions have been soaking in and then return them to the same bowl. Using 1 cup of flour, dump it in with your onions and toss them around, it will soak up any leftover liquid and give the batter something to stick too. Put them aside. In another bowl mix the 1 1/2 cups flour, seasoning, salt, baking powder, and 2 cups of beer. Using a whisk get it as smooth as possible. A few lumps won't hurt a thing. Batter on the left and flour covered rings on the right! When the oil is heated up, take your flour coated rings and dip them in batter, let the excess drip off and put into your oil. They will take 2-3 minutes per side. Or, you can let them go until they are a color you think they should be and flip them over! Repeat. Drain on paper towels or a cooking rack as I did. We like our onion rings a little bit dark in color! Give them a light sprinkle of salt if you like and serve! I love, love, love onions! :) My favorite "form" is raw. I put them in practically everything. Yum! Looking at the finished product, these look just like the best onion rings I have ever eaten, made at a restaurant in La Jolla, CA! Most places use some sort of bread crumby batter that I don't care for. Gotta try these! Thanks! Looking at the finished product photo, these look just like the best onion rings I have ever eaten! They were from a restaurant in La Jolla, CA. They served them with a sprinkle of parmesan cheese. So much better than the majority of other places that use some bread crumby type batter. I've gotta try these! Thanks! I hope you get to try them and they are all you hope they are!! GREAT idea with the sprinkle of parm! Thanks for reading!